Art knows no zero point. It has no concept of an outside place, no indefinite expression; it is impossible to represent “nothing”. French cultural theorist Roland Barthes was the first to point this out. According to Barthes, every work carries with it the illusions of the culture in which it was made. The mesh of everyday myths is unavoidable; art history’s thicket of the codes impenetrable. But for all its impossibility, the desire for this kind of zero point, the yearning to see without codes and connotations, remains essential. We all long for it. 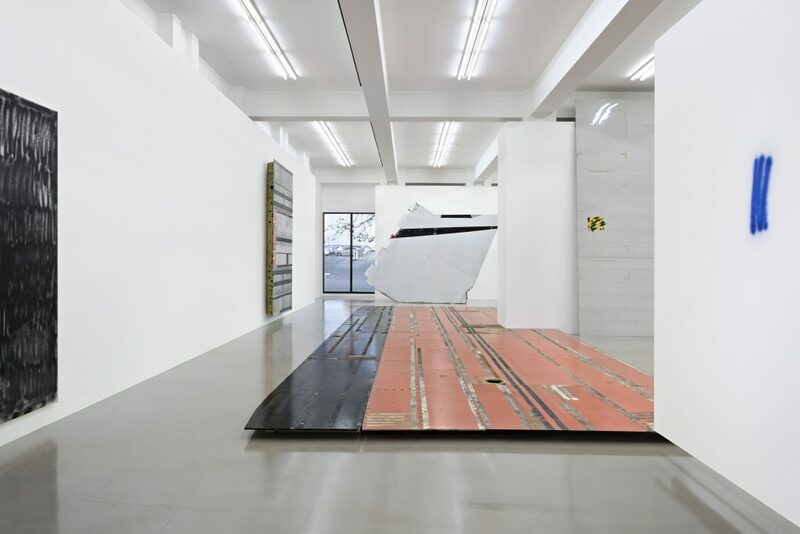 Astonishingly, the works of young Cologne artists Michail Pirgelis and David Ostrowski diligently strive toward this precise way of seeing. The sculptor and painter have been close friends since attending the Kunstakademie Düsseldorf, where they studied under Albert Oehlen and Rosemarie Trockel. Though their projects could hardly be more different, they are pursuing a similar artistic vision. In this sense, the succinct, ironic title of the exhibition Nothing Happened could also be understood as a programmatic, shared objective. Both artists try to explore the “zero point” of art while completely aware of the futility. They seem to ask what would happen if nothing had happened, and raise the almost heretical question of whether it would be possible to start over from scratch. Michail Pirgelis’ works begin with materials from discarded aircraft, which he culls from airplane cemeteries in California and Arizona. Pirgelis alters these materials only minimally, leaving the painted surfaces on most of his objects as he found them. He is known to grind and polish select cut-outs, remove portions of lettering or uncover rivet lines, so the viewer essentially finds a surface marked by weather elements and traces of use, the sand, sun, and desert storms. They are complex aesthetic surfaces that bear a clear reference to painting. In a sense, these objects could also be read as “found abstraction”. Large-scale wall works like Second Chance (2016) or Neverending Story I (2014) have the look of heavy canvases, while the floor panels in works like Beer or Wine (2014) recall minimalistic sculptures. But for all the clear visual references, Pirgelis’ objects could hardly be a more radical undermining of these same art-historical traditions. 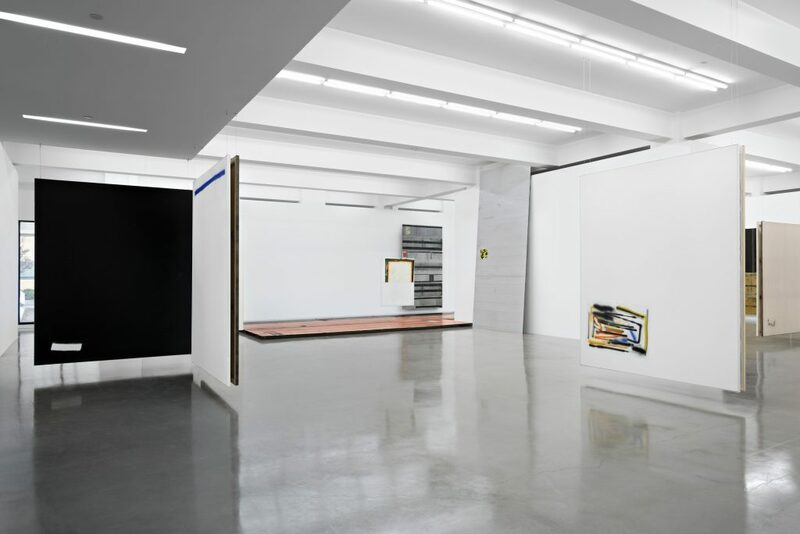 None of his objects has the pristine, immaculate surface of a Donald Judd or Carl André. None of them is “invented”, “produced” or even “commented upon”. They are not even readable as ready-mades, because it is impossible to see what the sculptures once were. The objects’ materials and existing forms have been completely stripped of their original purpose. Pirgelis’ works take viewers to the limits of their unconscious knowledge of what constitutes an object. They are sculptures that thwart their own objectivity, situating themselves on the brink of non-objecthood. It isn’t hard to see a similarity to David Ostrowski’s works, where the effect of surface plays an equally important role. But what Pirgelis “finds”, Ostrowski paints. Ostrowski’s light-touch, philosophical circling of the non-motif pares the painter’s toolbox and materials to a bare minimum. The often large-scale, monochrome works betray a hint of spray paint here and there, mostly as an unspectacular, but compositionally effective line or outline – a kind of inner frame that shifts the outer boundary of the canvas to the picture plane. Sometimes the line evokes pictorial associations, as in F (In Treatment) (2016) or F (Lieber nackt als Gefühlsleben zeigen) (2016), only to almost immediately negate them. Other paintings show traces of his studio, like remnants of adhesive tape or paper. Ostrowski’s pictures are characterized by a conscious rejection of painterly codes, traditions and classifications. What we find instead is a methodological facilitation of coincidences and errors, impressions and mistakes. This paradoxically results in a highly atmospheric body of work – testifying to an extraordinary aesthetic sensibility. Robert Rauschenberg’s detritus-laden White Paintings might serve as an art historical reference point, as could the meditative works of some later Abstract Expressionists. But like Pirgelis, Ostrowski thwarts the subliminal, ideological approaches taken by these same art historical predecessors. His works bar pathos of any kind, and decidedly reject the idea of the canvas as a sacred space. If these references appear in Ostrowski’s painting, then it is only to stage their failure and reveal what is behind this failure. The works of both Ostrowski and Pirgelis, elude – with surprising consistency – almost any attempt at aesthetic categorization; they have an enigmatic way of seeming almost indescribable, origin-less. The forced elimination of painterly and sculptural knowledge creates a fundamental pictorial uncertainty – an effect of perception that hovers between rebellion and the sublime. Ultimately, Nothing Happened, the title of this exhibition, could also be read from a different angle: not in the sense that nothing has happened, but in the sense that the “nothing” happened here, that what happened is the “nothing”. Both artists try to open themselves to the unforeseen, to the possibility of contingency and the aesthetic experience of nothingness. Their works accept the often inevitable failure of art and take it seriously, and this is precisely how they open up a new space of perception – one where the viewer can experience moments of complete and utter visual freedom. In toeing the line between apathy and seduction, the works of both Pirgelis and Ostrowski show that you never really start seeing until you no longer have any way of understanding what you are actually looking at.